With the Spring Series dominated by stronger breezes the final race ended the series with a whimper rather than a bang, however the competition for podium positions was undiminished and went down to the wire. The scene at Gilkicker for the final race of the series was a SOOD nightmare. A reduced fleet and a very light, unstable wind - welcome back from holiday - Option! With the forecast for northeasterlies the southeasterly wind 15 minutes before the start caused some head scratching on the SOOD boat, but with the water to the west looking very glassy a short windward / leeward course of a beat to North Sturbridge into a strong west going tide and a run home seemed to be the best bet in a breeze expected to die. With only six boats on the line plus the Royal Engineers J109 - Trojan sussing out the RNSA racing scene, the starts were reduced to one only at 1830. The majority of the fleet opted for the shore at Gilkicker to start although Tinker T preferred the faster tide in the deeper water coming into the first mark Darling Associates with more pace under a starboard pole spinnaker. This proved to be a winning manoeuvre. Meanwhile at the start an over eager Danegeld was called OCS and thereafter she struggled to recross against a raging tide. As Tinker T dropped her kite at Darling and hardened up for the beat the wind swung hard left back to northeast and the beat turned into a fetch. The boat challenging hardest for the top spot in the series then began its challenge. Jolly Jack Tar with sheets slightly cracked came roaring up behind TT and by North Sturbridge her better pace gave her the lead which she extended on the leg back to Darling with a great angle for her asymmetric kite. However the fat lady was yet to sing! The one cable distance from Darling to the finish line against the tide and with the wind dying to 3 knots proved an almost insurmountable obstacle and TT able, with her lesser draught to get closer to the beach finally snuck out a lead of a couple of boat lengths and took line honours. This last gasp effort gave her the series win in both IRC and NHC. Thought for the day - A 10M yacht sailing at 0.7 kts takes 27.7 secs to sail one boatlength. FORTHCOMING RNSA(P) EVENTS: The RNSA(P) Wednesday Summer Series starts on Wed 30 May first start 1830. 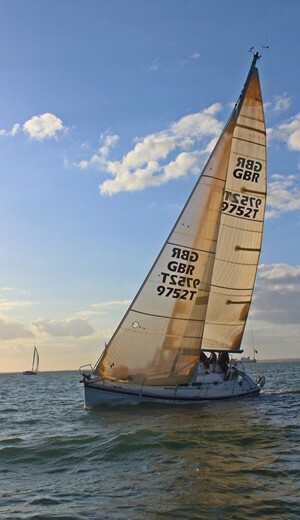 The Yarmouth Trophy: A race for IRC yachts and cruisers to Yarmouth on Sat 16 June, party and return on Sun 17 June. A great fun weekend that I commend to all. Details on the RNSA website.